On April 4th 2014, the HHS Office of HIV/AIDS and Infectious Disease Policy (OHAIDP) convened a full-day consultation to explore opportunities for nonfederal stakeholders to engage in the implementation of the updated Action Plan for the Prevention, Care and Treatment of Viral Hepatitis (2014–2016) . Consultation participants represented a variety of sectors including community leaders, patient advocates, health departments, health care providers, researchers, and the pharmaceutical industry. Many of the federal agencies and offices engaged in the Viral Hepatitis Action also participated. Four key themes emerged from the consultation along with many specific recommendations for actions that nonfederal stakeholders might undertake to drive progress across the plan’s six priority areas. We have prepared a brief summary report that highlights the innovative themes and specific recommendations that consultants shared during the meeting. We hope that these recommendations will motivate other stakeholders to creatively engage in growing efforts to improve our nation’s response to viral hepatitis. All stakeholders, nonfederal and federal alike, are encouraged to review this report—as well as the Action Plan – and consider how their work might be able to help our nation achieve the life-saving goals of the Viral Hepatitis Action Plan. 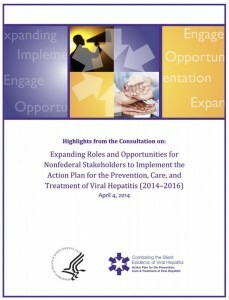 The updated Viral Hepatitis Action Plan (2014-2016), released the day prior to the consultation, builds on the success of the nation’s first comprehensive Viral Hepatitis Action Plan (released in 2011) and spells-out more than 150 strategic actions to be undertaken by federal agencies and offices around six priority areas. Because federal action alone cannot achieve the goals of the Action Plan, the updated plan includes “Opportunities for Nonfederal Stakeholders,” in each of the plan’s six priority areas. During the consultation, participants discussed and expanded upon those suggested actions and offered additional ideas. Expanding the number and variety of partners who are engaged in efforts to address viral hepatitis in the U.S. is vital to achieving the goals outlined in the Action Plan. We hope that this report along with the Stakeholders Workbook, released earlier this month, will help to foster new and expanded engagement in the implementation of the Viral Hepatitis Action Plan.